Tom Woodhouse, Site Services Manager at Marley Eternit, explains how correct roof ventilation can prevent costly callbacks for condensation problems. Our Site Services team and Technical Advisory Service often receive enquiries where homeowners discover moisture within the loft space. When we investigate the cause, it is usually condensation forming due to insufficient ventilation when the roof has been installed. Obviously, it is a costly process for contractors to then go back and rectify these mistakes and repair any damage caused by condensation in the home. The best way to avoid this is correct ventilation from the outset – which means complying with BS 5250:2011+A1:2016 ‘Code of practice for control of condensation in buildings’ and BS 9250:2007 ‘Code of practice for design of the air tightness of ceilings in pitched roofs’. The term ‘breathable’ underlay is quite often misunderstood because it suggests that ventilation is not required. However, the British Standard BS 5250, ‘Code of practice for the control of condensation in buildings’, does not include the option of no ventilation to the roof void. As such, roofs will always require some form of supplementary low and high level ventilation in accordance with BS 5250. 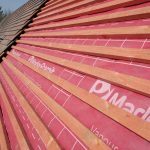 There isn’t a one size fits all answer to ventilation and fibre cement slates or shingles – it depends on a number of factors, including what type of underlay you are using. If you are using a vapour permeable (breathable) underlay, then it needs to be counter battened to allow adequate ventilation of the batten space. 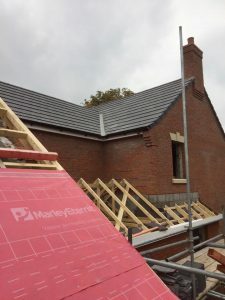 It is, therefore, necessary to provide a 50mm ventilated batten cavity above the underlay and below the fibre cement slates or shingles (comprising 25mm deep counter batten and 25mm deep tiling batten). This cavity should be ventilated equal to 25mm at the eaves and 5mm at the ridge. When using a non-breathable underlay, then you do not need to counter batten but traditional low and high level ventilation must be used (below the underlay and above the insulation) in accordance with BS 5250. Ventilation is the sum of all of its parts and shouldn’t be dependent on one single product or method. Just as you should get a new fixing specification for every project, it is advisable to do the same with ventilation. At Marley Eternit, we can give you free roof system specifications, including underlay and ventilation, to reduce the risk of condensation. Because there is a small amount of air openness with interlocking tiles, there is a myth that you don’t need additional ventilation if you are using a breathable underlay. However, this is not the case. For the purposes of BS 5250, all variables in the roof build-up, including the external covering such as standard interlocking tiles, must be considered. As such, roofs will almost always require supplementary low and high level ventilation. If you’re increasing the loft insulation, then you need to check ventilation hasn’t been compromised as this can produce a condensation problem. If there is eaves ventilation then it is important that the effective air path is not blocked. Where insulation at ceiling level is more than 300mm deep, then we now offer the Universal Eaves Vent Plus system, which has a wider rafter roll and ensures airflow.